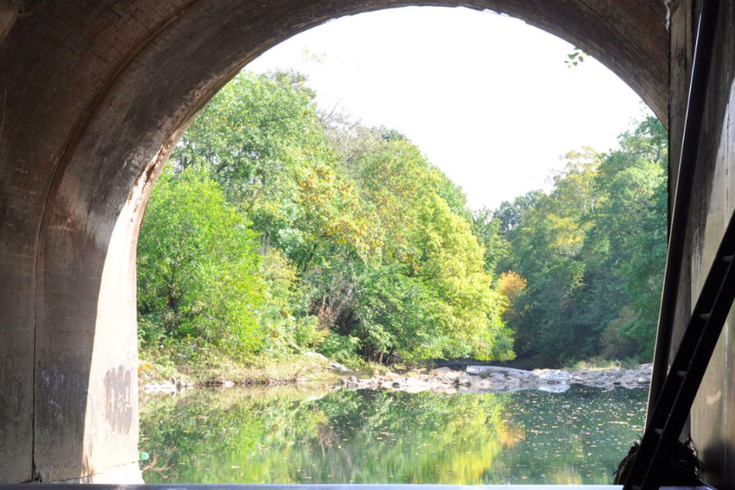 View from Philadelphia's Wingohocking Street Sewer. As one of the oldest cities in the United States, and also its fifth largest, Philadelphia has had to rely on ingenuity to keep its aging sewage system intact while sticking to a realistic budget and keeping waste as distant from the life of city residents as possible. The challenge is enormous: Each day, Philadelphia's sewage system handles around 471 million gallons of waste, all flowing through pipes that would extend 3,716 miles – nearly the distance from New York City to L.A. – if lined up in a row. In a detailed feature on how Philadelphia is solving its sewage nightmare, Popular Mechanics examines the challenge of managing excess waste in an antiquated system that routinely spills grime into public spaces that residents use for recreation. "It's a problem because one, it smells, and two, it's not just full of trash. It's full of diapers, condoms, some of the nastiest of the nastiest, and people are going to see it," said Chris Crockett, Deputy Commissioner of Planning and Environmental Services for the Philadelphia Water Department. "We're in the 21st Century and we're trying to get to Mars. How can the fifth largest city in the U.S. still have sewage going into all its streams and rivers, millions of gallons in any given rainstorm? And some people are out there swimming in it. What's the difference between that and swimming in a toilet?" The root of the problem stems from the way the system was constructed, prior to the days of modern cities like San Diego and Austin, which has separate pipes for stormwater and sewage. In Philadelphia, the combination of waste and stormwater leads to alarming spikes in volume, all of which must be sent to a treatment facility. For an immediate fix, the city uses a series of outfall points at its sewers to either allow or temporarily prevent the passage of excess waste into waterways – not an ideal solution, but certainly better than backups bursting into basements. Designed like a tree, the city's network of pipes takes waste from homes into street branches, arteries and main pipes, finally reaching a treatment facility. Rebuilding the system to better manage excess waste would be both prohibitively disruptive and costly, so at the turn of the century, Philadelphia embarked on a green infrastructure plan to absorb more water and reduce excess stormwater runoff. The $2.5 billion plan, financed for 25 years through wastewater and stormwater bills, entails the installation of rain gardens, porous pavements and hundreds of green roofs around the city, in addition to fees and incentives for commercial and residential property owners. "We're literally doing 12,000 acres of green infrastructure, or 19 square miles. It's the most comprehensive green infrastructure in the U.S., if not the world," Crockett says. "It's the equivalent of tricking the hydrology so it looks like 43 percent of our pavement or hard surfaces disappear. And in doing that, we're getting rid of 9 billion gallons of sewage overflows into our waterways by controlling the stormwater at the source." By 2016, Crockett says Philadelphia will exceed its target of 744 greened acres, reaching about 10 percent of the overall goal and cutting overflow into waterways by more than 600 million gallons per year. All told, the city is aiming for 9,564 greened acres, which amounts to about 15 square miles, by 2036. Gradually, the new infrastructure will aim to keep pace with the anticipated climate changes spelled out in the city's first ever climate readiness report, released earlier this week. Based on the predictions – warmer and wetter weather conditions for years to come – Philadelphians will be reassured to know their water bills are staving off a future of four letter storms.